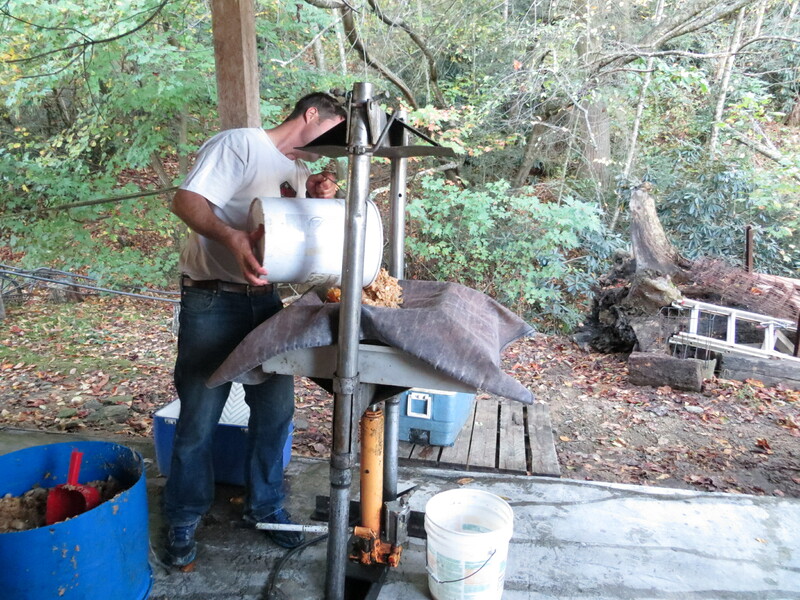 Every fall for the last few years, William, the children, and I take parts of a few days to make a few runs of cider. We live beside an unsprayed apple orchard which often provides plenty of fodder for the cider press. This year, we made one cider run a few weeks ago and I thought that might be all we would do. 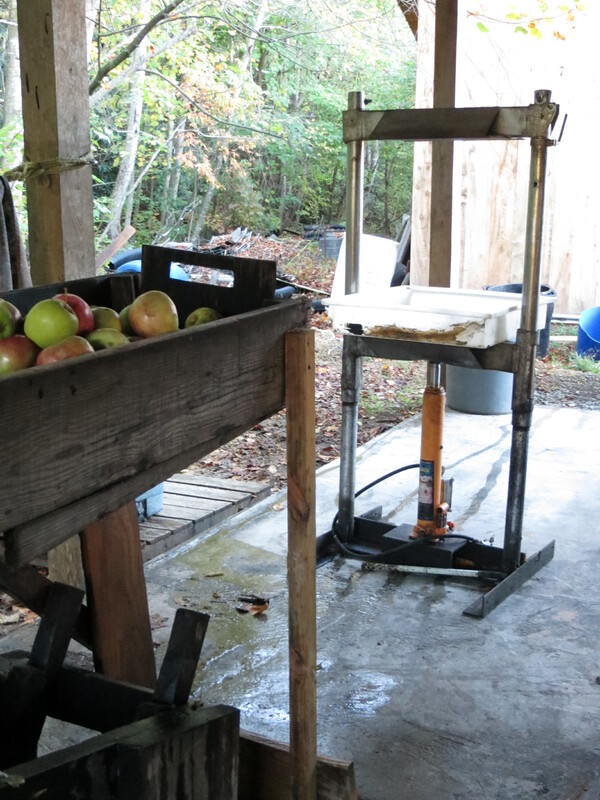 The apple crop was not great, but we had enough to make the cider and for me to make 20+ quarts of applesauce. We have also been quite busy this fall with kids soccer, work, camping, and out of town trips. 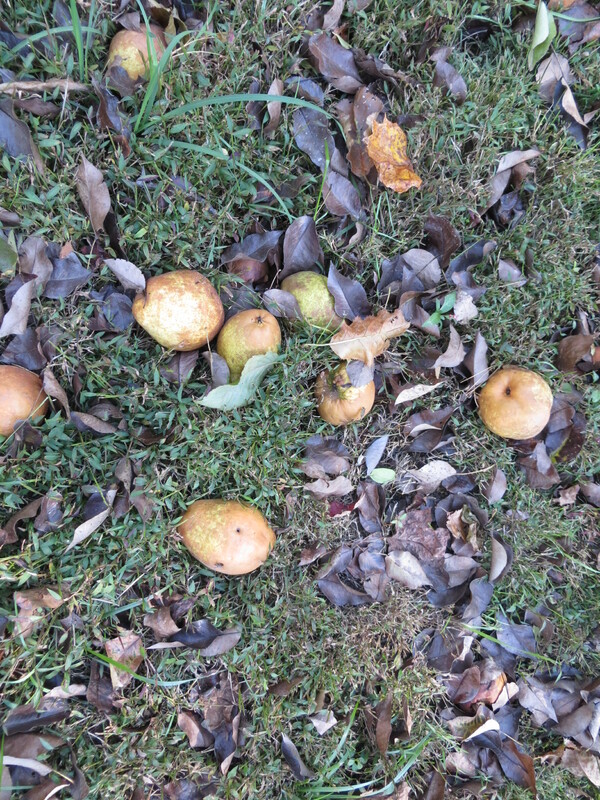 But, on Sunday morning William mentioned there were a lot of pears on the ground. 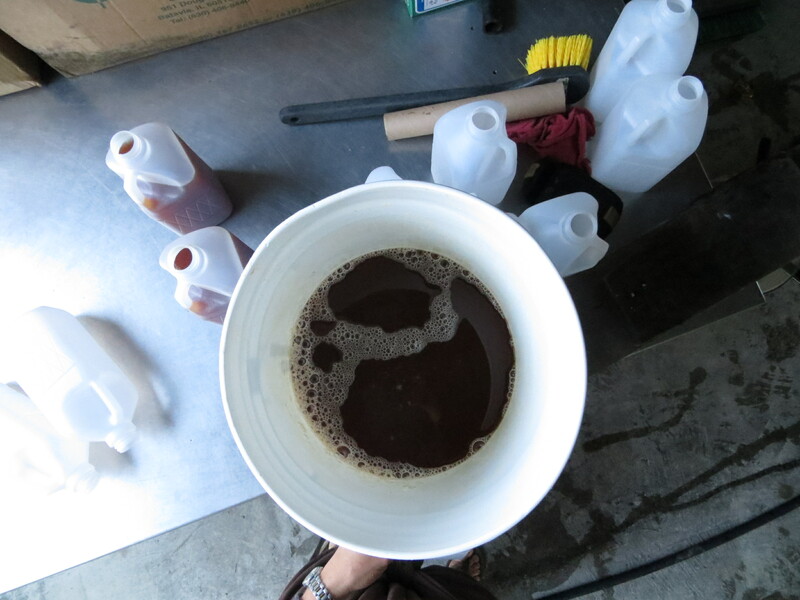 Let’s make cider – I said. And, he agreed. 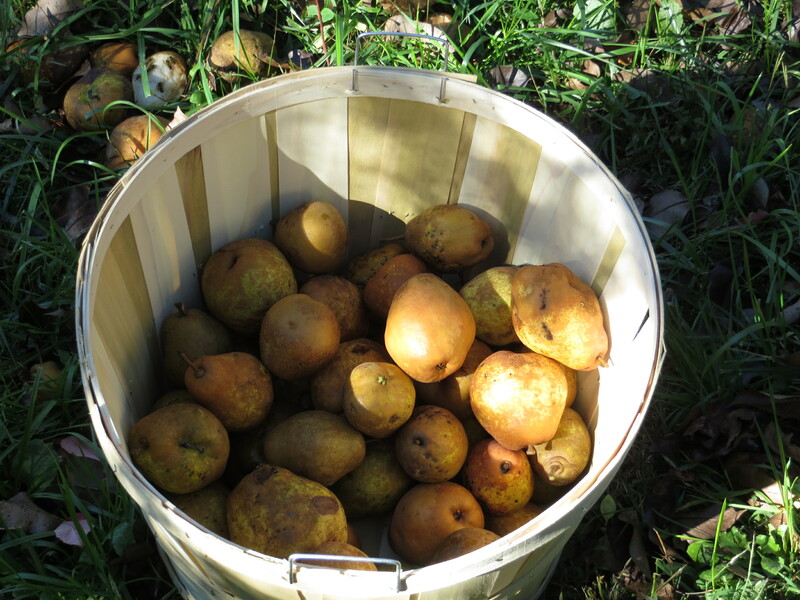 We have a large, stately, and beautiful pear tree near our house that in the spring is white with blossoms (when we call her the Snow Queen) and in the fall drops large, hard, tasty pears – deigning to allow us her fruits. And, she yields wonderfully every year there is not a late freeze. 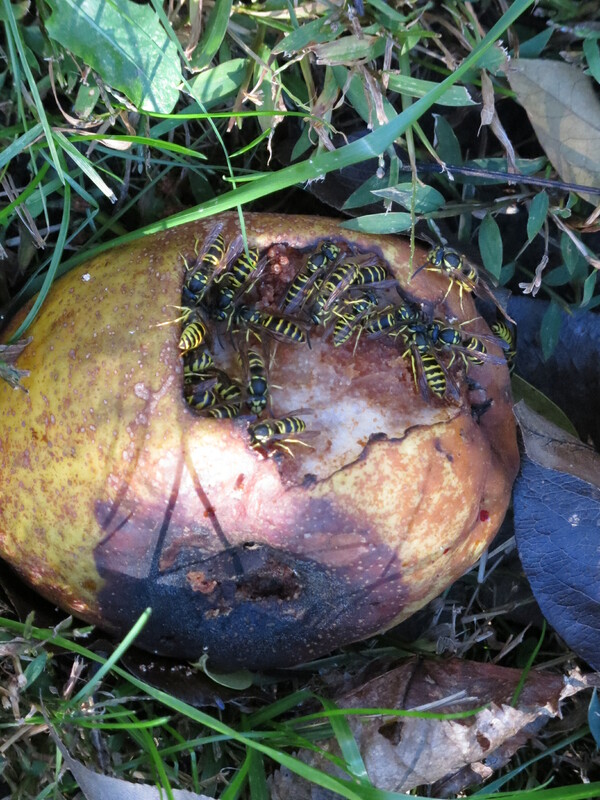 I picked up four bushels of pears with Hythe helping me (Evva would not help claiming the yellow jackets were too dangerous – so she played fairies in the grass). You have to watch where you put your hands when picking up the pears, but most looked good having been knocked down just a few days before by an all day rain storm. I always feel these pears must look like the golden apples that Atalanta stopped to pick up during her fateful race. 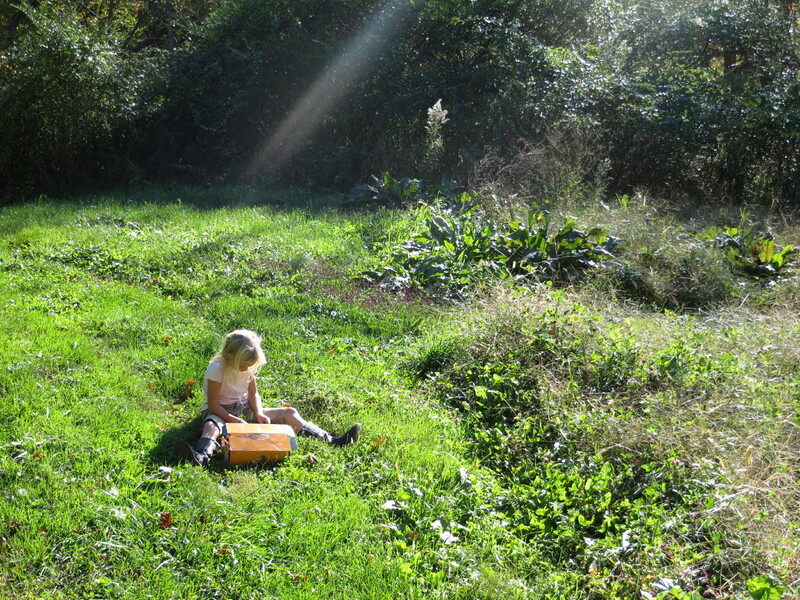 We finally got around to cider making fairly late in the afternoon, when the weather quickly goes from warm to quite cool, so I packed up coats and sweaters, knowing that cold children (and mamas) can be really unhappy. 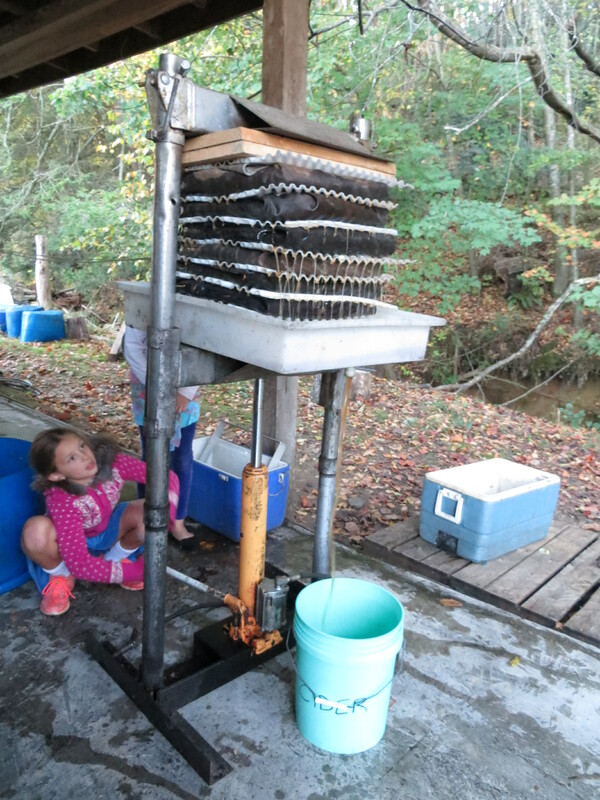 This was supposed to be a family activity, but right after we picked up the pears and arrived at the cider press (at Hickory Nut Gap Farm), all the children disappeared. Anne, her friend, and Evva rode off on bikes and Hythe almost immediately rode off on a horse (with his great aunt and cousin). We were left with a grumpy Steven, who kept pointing at the road and demanding “home”. So, we decided that I would set up and start grinding the pears and William would go get beer, and we would enjoy this moment, by gosh! And, we did. The three girls showed up in time to help finish grinding pears, to press, and to clean up. We use an old grinder and press that William’s grandparents had made and used for years. It is the only press I’ve ever used. I made cider on it the first time 17 years ago. 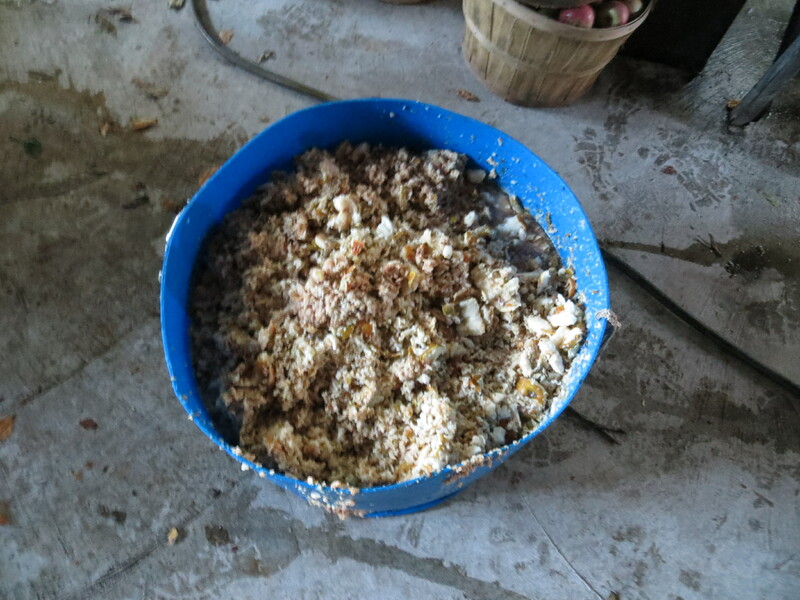 The pressing went very easily and quickly, and clean up was fast. 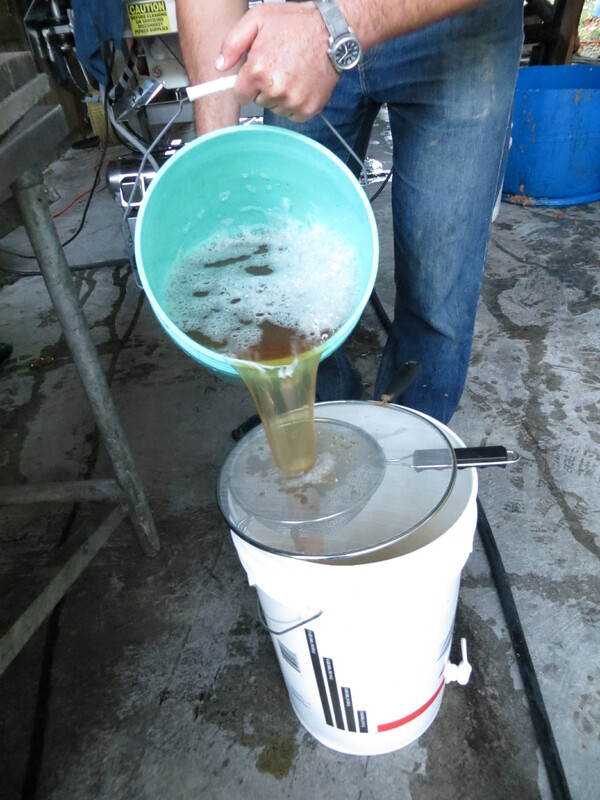 And, we ended up with 12 gallons of pear cider. It is probably because we make this ourselves, but I think this cider is the best! We freeze it and enjoy ice cold cider all year. I do love this tradition that we are making. Oh Molly what a time you had! I hope when I come visit, you will have one taste left for me. I think I pears are my favorite fruit. I’ll bring some at Thanksgiving! yum! 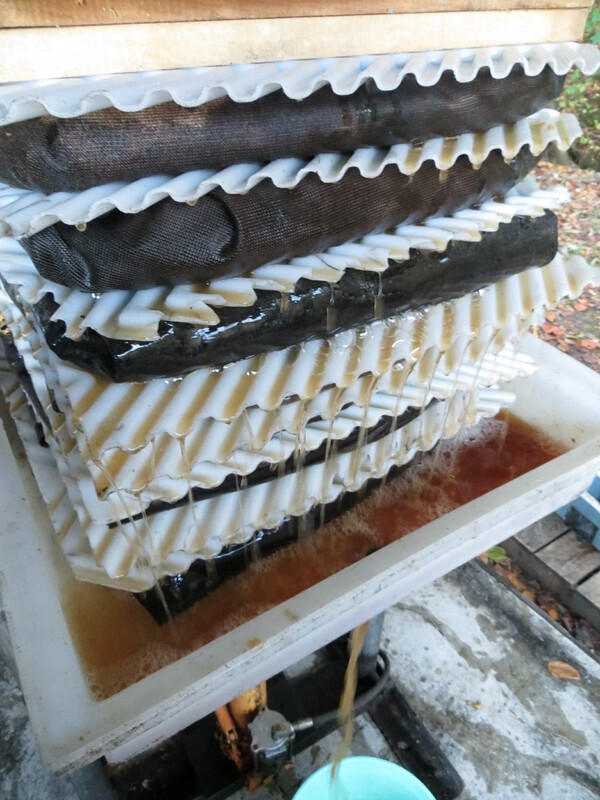 we just finished pressing about 8 gallons of apple cider with the homemade car-jack press- 5 for fermenting into hard cider, 3 in jars in the fridge for now. 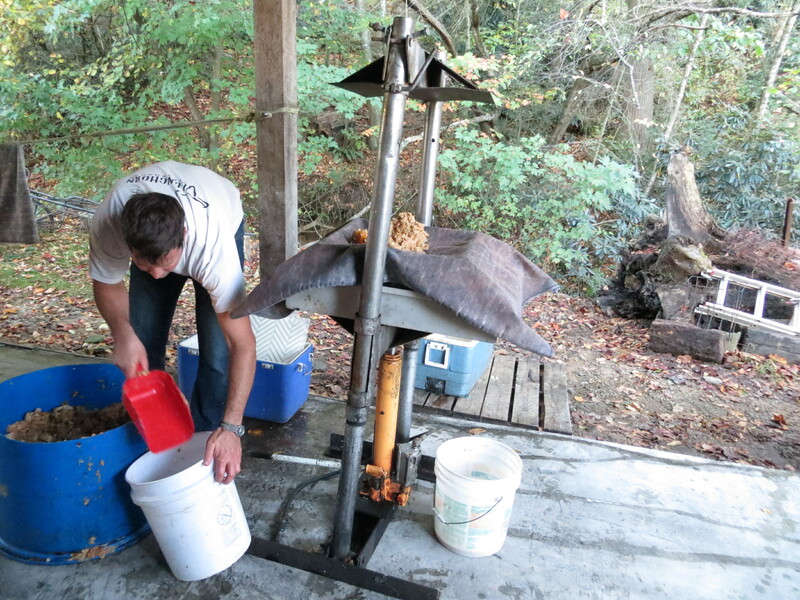 depending on how many more we can glean there may be another pressing. 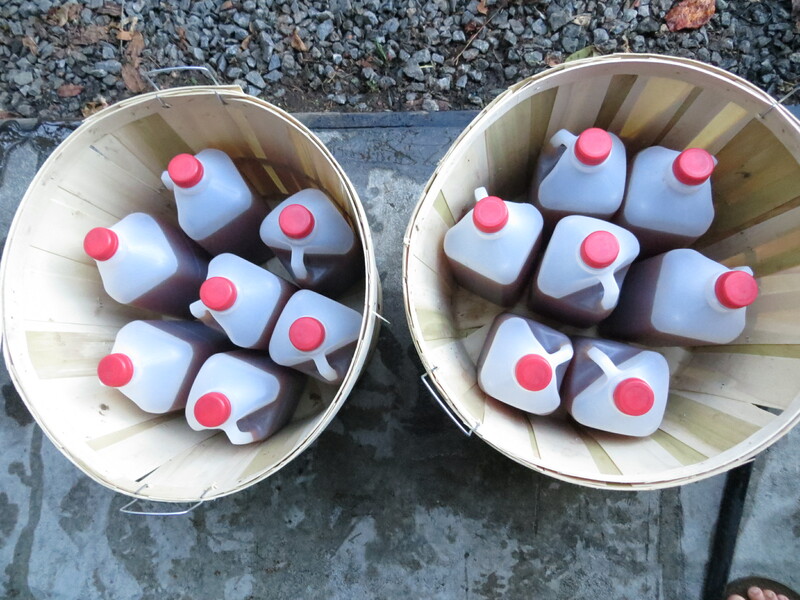 did you get your 1/2 gallon jugs locally? that’d be way more convenient, I think, for freezing than our glass jars…. 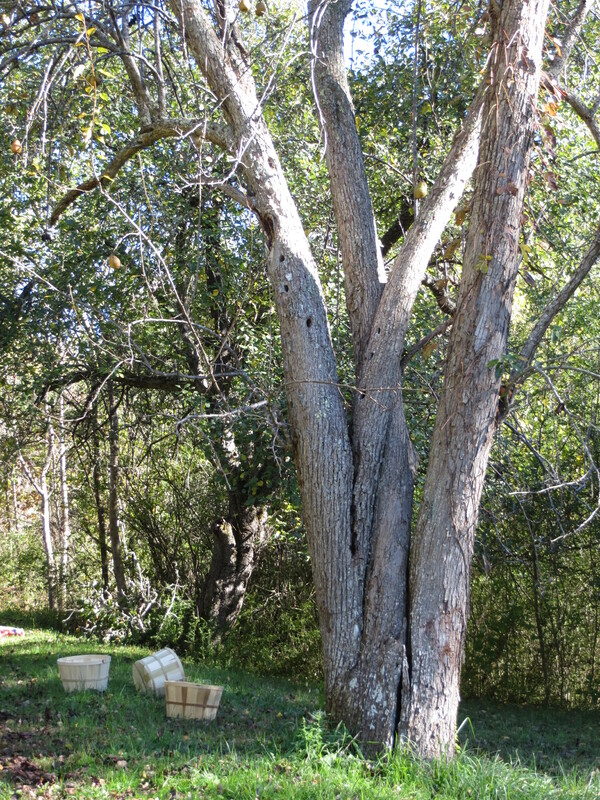 oh to have a huge pear tree! we have one, it’s about 2 years old and is yet to fruit, but one day…. Nice! I am really interested in fermenting cider for hard cider or brandy, but I don’t know what to do! And, am hesitant to buy equipment. I am not sure where the farm gets their jugs – I’ll ask. It may be from Ray’s Bags in Arden. I am loving your blog, Molly. The image of Hythe trotting off on a horse pre-cider pressing is just too funny. Thanks for sharing these slices of your beautiful life! Thanks, Sara! Hythe loves to ride, and ride “fast”. I hope I’ll get to see you this winter, and meet the little one!